Lake effect snow and bitter cold will arrive in the FInger Lakes this morning on gusty northwest winds. Wind chill advisories have been issued for much of the region. Cold air will drop south into the Finger Lakes Friday on strong northwest winds, leading to lake effect snow and some very cold wind chills. Temperatures have started the day in the upper 20s as a clipper system lifts northeast through the area. Most of the snow from this system has pulled out of the region, though some areas are still seeing the snow. Lake effect snow should form off of Lake Ontario this morning across portions of the northern and eastern Finger Lakes, especially from Wayne county through Cayuga and into Cortland county. A couple inches of snow will be possible from the lake effect in the areas it remains the longest. Cold air from Canada will begin its invasion by the mid-morning hours. By the mid afternoon, temperatures will only be around 10º with wind chills already near or below 0º as winds gust to 30mph. Low temperatures overnight should be within a few degrees on either side of 0º, depending on geography and proximity to lakes. With strong winds continuing overnight, wind chills will be as cold as -20º Saturday morning. 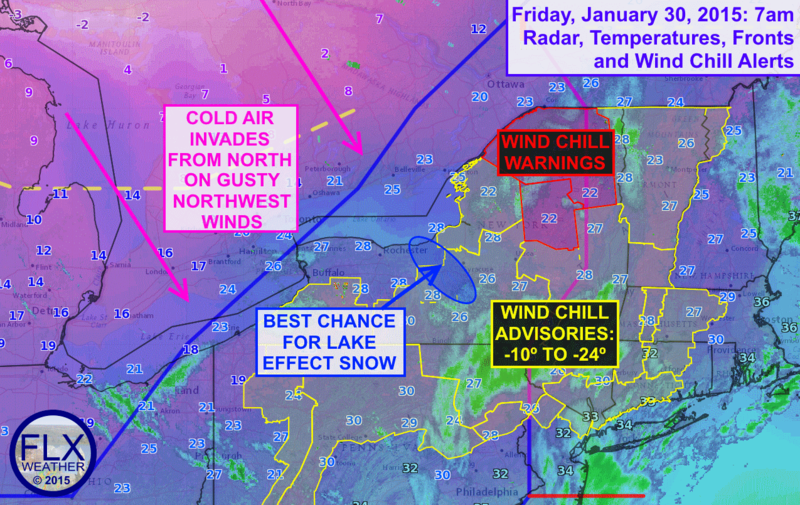 For this reason, wind chill advisories are out for all of the Southern Tier and eastern Finger Lakes. Temperatures Saturday afternoon will only be in the mid and upper teens. The wind will be much calmer by Saturday afternoon. Clouds from a storm system tracking mostly to our south may keep us from dropping too low on Sunday morning, with lows mostly above 0º, with highs reaching towards 20º. There is still a chance for some snow Sunday night into Monday, but this remains uncertain as the forecast models swing back and forth on the track of this system.